OLC (Ohlson Lavoie Collaborative) is pleased to announce the completion of the renovation to the DoubleTree by Hilton, Denver. 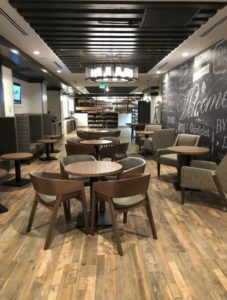 The $5 million, 13,400 sf renovation embraces the western heritage of Colorado lifestyle with a modern sophisticated twist and includes the remodel of the lobby spaces to include the Grounded Grab ‘n Go, the Hub Bar and the Knife & Board Restaurant. Through collaboration with the owner and Hilton Food and Beverage, the OLC team developed a functionally flexible layout which provides free flowing access to all areas, allowing the guest to have a variety of experiences within the hotel. The décor incorporates a modern interpretation of Colorado’s western heritage, inspiring environment and healthy lifestyle through the use of timeless, authentic materials combined with unexpected local flare and interesting architectural details and materials. This is exemplified by the marble floors and columns combined with wood plank and metal dividers, aspen log accents, and a large double-sided linear fireplace with back lit Appaloosa pony. The new Hub Bar, within sight as soon as the guest enters the hotel, offers a rich combination of Colorado; the wild beauty of the west tamed by the civility of the city. Like the wild western Appaloosa, though tamed, we’re just this side of wild. 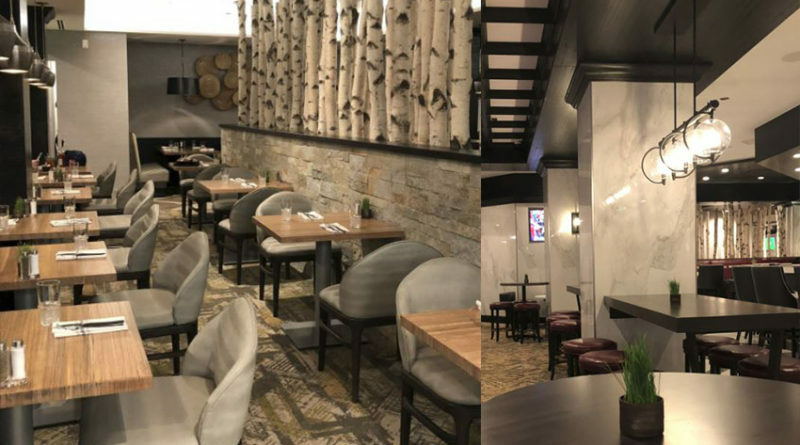 Authentic materials of wood, marble, iron, and glass create an environment in which to enjoy happy hour after work or relax with fellow conventioneers. 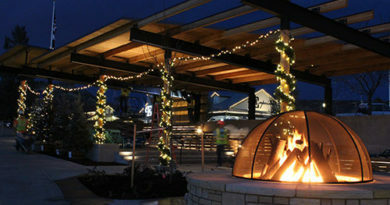 Both guests and locals will love the elongated double-sided fireplace, glow of the Appaloosa, and cozy bar seating with a friendly mixologist to create the freshest signature cocktails. Local craft beers flow from the 16 beer taps while local music creates a high end experience. The unique environment created by the low lying meadow with a slow stream and the quake of aspen tree canopies above a soft, flat grassland, fosters a quieting of the soul. This is the guest experience in The Knife & Board restaurant. In keeping with the natural décor, the restaurant will be filled with a soft buzz of content diners, surrounded by local music, changing with the time of day. Service is Colorado friendly, with a welcome smile, and non rushed demeanor. The menu features a healthy offering of locally sourced produce and grass fed meats. Menu options change seasonally with unique Hilton Chef inspired offerings which range from the wild to the civilized. Locally inspired pizzas and breakfast calzones emit mouth watering aromas from the visible pizza hearth. The new Grounded Grab n Go is inspired by the vintage coffee house and casual family store, “gone urban”. Display cases of locally made sandwiches, parfaits, salads and entrees welcome hungry and thirsty guests. “We Proudly Brew Starbucks” baristas welcome guests to concoct the beverage of their choice. 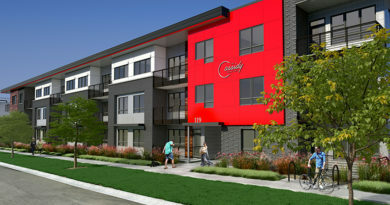 Coffee and drink in hand, the guest is invited to settle into a private cubby, lounge chair, or chat with others at the communal or dining tables. Warm woods, vintage bead board, rustic flooring, and an interesting word wall create a welcoming and comfortable place to pause prior to the busy day ahead. 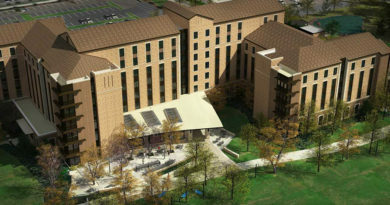 OLC recently began the design of the DoubleTree by Hilton, Denver Guest Tower renovations. This will be OLC’s third project for Hilton. 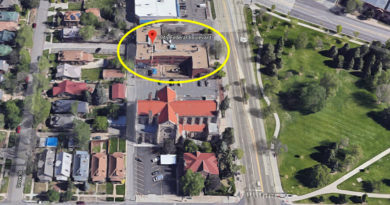 In addition, OLC is currently working with Ken Caryl Ranch Metropolitan District, the City of Lakewood and Glenmoor Country Club on multiple pool renovation projects.